From the Need for Speed Undercover line. 1:64 Nissan GT-R Police version due out in Spring, 2009. Japan has had R32, R33, R34 GT-R police cars in the past. I don't remember seeing any R35 GT-R police cars in Japan yet. 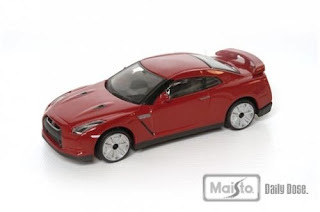 Maisto also has a couple of 1/43rd scale R35 GT-Rs from their Bburago line - red and white that are waiting approval.